It’s confession time: As much as I enjoy homemade, baked macaroni and cheese, Annie’s shells and cheddar holds special place in my heart. I was quite pleased to discover during our kitchen renovation that this childhood favorite — the blue box never graced our pantry growing up — is now available in a gluten-free version! I feel like everyone has their own way to doctor up boxed mac and cheese, but my secret to a better experience doesn’t require any additional ingredients, it’s quite simple really: use only about two thirds of the pasta. But what to do with the resulting stockpile of leftover, uncooked shells? That’s where this recipe comes in. This stovetop macaroni and cheese just about as quick to make as Annie’s, and a great way to use up extra nubs of fromage in the fridge (not usually an issue in my household . . . for some reason). And if you’ve never worked with roux before, do not stress — it’s really quite an easy thing to master and will totally expand your culinary horizons (I see many velvety sauces in your future!). When it comes macaroni and cheese, what are you looking for? Boxed (any modifications)? Baked or stovetop? Topped with breadcrumbs? How many kinds of cheese? Let me know! It takes a few boxes of Annie’s to save enough pasta shells to make this dish — thankfully, Tinkyada makes a brown rice pasta in a small shell shape that works just as well! Bring water (NO SALT) to a boil in 4-quart or larger pot. Stir in pasta, return to boil then reduce heat to medium. Cook, stirring occasionally, until about 2 minutes shy of al dente (about 6 – 7 minutes for Tinkyada shells). Remove pot from heat and allow pasta to continue to cook in the hot water while you prepare the cheese sauce. In a small saucepan (2-quart), combine butter through Kosher salt. Set over medium heat and whisk occasionally until butter is melted and mixture begins to foam (about 30 seconds – 1 minute). Pour in about 1/2 of the half and half, whisking rapidly. Once thick and smooth, whisk in remaining half and half. Bring mixture to simmer, and continue to cook until the mixture coats the back of a wooden spoon and when you run your finger through it a distinct track remains. Immediately reduce heat to low (as low as your stove allows) and add cheese. Switch to a spoon (the cheese tends to get annoyingly stuck in my favorite-tool-for-cheese-sauce flat whisk), and stir constantly until cheese is melted. Remove from heat. The pasta should be perfectly cooked at this point. Drain pasta (do not rinse with cold water) and return to its pot. Pour hot cheese sauce over pasta, stirring well to coat. Serve immediately! 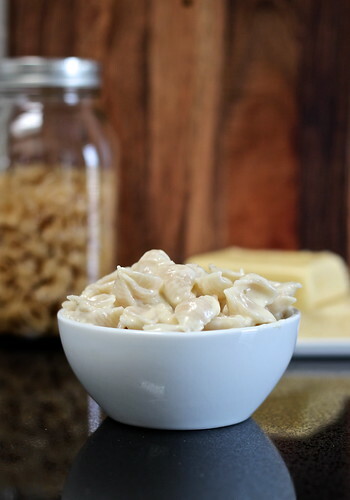 THIS…finally a GF Mac & Cheese!!!….Yes…PLEASE!! !…Here on the French/Swiss border…there is NO apparent lack of lush melty cheese to be found…I’m thinking of gruyère…or raclette for the molten aspect…and some sharp cheddar…well…for the true Mac & Cheese taste experience!!! Sometimes it can be difficult to locate (one of the few cheeses definitely NOT French or Swiss…but I could use a sharp mimoletta for the orange-y hue and it does have a taste reminiscent of cheddar! Great “roux” tutorial by the way…spot-on correct and well-detailed!! Oh wow, totally drooling over here with all of the cheese possibilities you’ve listed — fantastic! I’m definitely going to try this with some Mimolette soon, before it’s [possibly] banished from the US. Thanks so much!! Just read the article…thanks for the link!…Hilarious, yet tragic…by the by..Mimolette is decidedly NOT France’s “favorite” or most revered cheese by any stretch…as they have 365+ choices on how to best please their palate at any given time of the year…My head literally spins with the vast selection at Saturday’s weekly outdoor market…and it is so difficult to choose!